In the summer of 1977, Elvis died at age 42. But before that by 1974, all the signs were already there for those who wanted to see. Elvis was bloated. He appeared stoned on stage. He was behaving erratically - sleeping in the day and waking up for burgers at night. Drugs were used to moderate his mood. Yet his minders pretended nothing was wrong. The show must go on. The future was so bright. 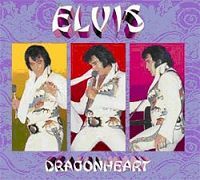 Dragonheart, the latest official release from the Presley vaults, finally offers a glimmer of evidence for those of us who never had a chance to see The King live. OVEN EGELAND writes from Norway about "The Pill-poppin' hillbilly". We have known it for a long time. Elvis in autumn 1974 isn't an easy listen, rather the opposite. This new CD from Follow That Dream [FTD] is further evidence  perhaps one of the best  that Elvis had personal problems during these months, and a new, very strong indication that he abused medications containing narcotics in significant amounts. On bootlegs from this era we already have a concert that Elvis held two days prior to the one featured on Dragonheart. This is among the worst ever released on tape (A Profile Vol 2), but the show in South Bend on October 1 only fares slightly better. The difference is mainly that Elvis was a bit more awake in South Bend, and seemingly in a better mood. His voice is poor on both occasions and his behaviour is unpleasant to say the least. Already from the first note on See See Rider, you know what to expect later on. His voice radiates a mixture of lack of sleep, depression and an artificially affected mood. Elvis isn't sympathetic the way he used to be, the wonderful humbleness that he always displayed is washed away. It certainly isn't the Elvis that deserves recognition decades after his death. Elvis soon tells the audience that there will be no requests taken the evening. However, later in the show he takes on and performs Steamroller Blues. A nice attempt, but not a version you will listen to very often. During autumn 1974, Elvis often encouraged his musicians to play solos differently than what they usually played on stage. This led to a classical number by Glen Hardin in College Park on September 28, and to a song called All Right, Okay, You Win in Detroit the day after. This number is featured on this CD as a bonus. Elvis sings the song in a hysteric manner, in a key nobody could reach on an average day. However, when Glen Hardin plays the same tune two days later in South Bend, Elvis suddenly starts to sing Lawdy Miss Clawdy. My goodness, did he pay attention to what was played or didn't he care at all? Hardin tries his best to readjust his piano playing. When Hardin is in tune, Elvis has finished singing! Other bootlegs show that Elvis would be better later on during the tour. Both concerts from Dayton, October 6 have been released and they are both of higher quality. Why FTD decided to release this show certainly puzzles me. It couldn't be due to good sound quality either as this CD features a rather poor soundboard recording. Lack of bass and something that reminds me of digital faults ruins the sound throughout the show. It's even noisy. The bonus tracks have better sound in my opinion. Strangely enough FTD decided to include a version of Trying To Get To You from College Park that Elvis totally ruins near the end. Is there a certain intention behind this release? After concluding Trying To Get To You, Elvis says, "Let me just get out the way and shut up." Why not have included this quote as a perfect ending of the CD. No, I'm not kidding! With such content in such a sound quality it is only natural that the cover looks like it does. If nothing else, there is a system in the madness. Low quality is the common denominator. A bummer this time from FTD! [http://home.online.no/~ov-egela/indexep.html] FTD releases are all officially approved releases but extremely limited.